*Hagstrum, J.T., 1994, Remagnetization of Jurassic volcanic rocks in the Santa Rita and Patagonia Mountains; implications for North American apparent polar wander: Jour. Geophys. Res., B, Solid Earth and Planets, v.99, n.8, p. 15,103-15,113. *May, S.R., Butler, R.F., Shafiquallah, M., and Damon, P.E., 1986, Paleomagnetism of Jurassic volcanic rocks in the Patagonia Mountains, southeastern Arizona; Implications for the North American 1790 Ma reference pole: Jour. Geophys. Res., v.91, p.11520-11544. 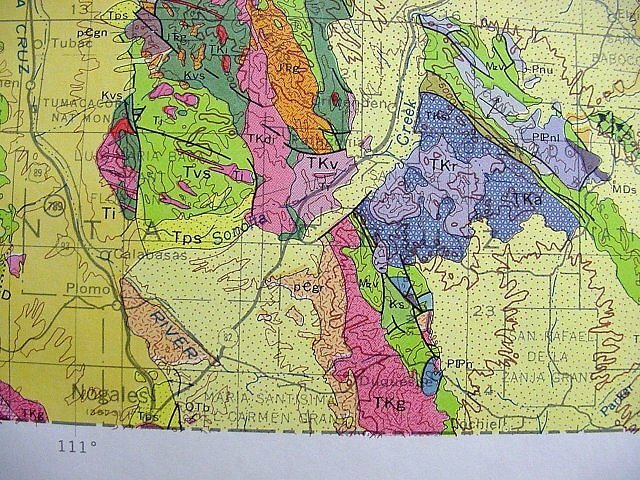 *Simons, F.R.,1972, Mesozoic stratigraphy of the Patagonia Mountains, Santa Cruz County: USGS Prof. Paper 658-E, 23 p.